Cozying up to a bowl of this Slow Cooker Creamy Chicken Wild Rice Soup on a cold, winter day will warm you right up! Comfort food for the win! When I think of my favorite comfort foods, one of the first things that comes to my mind is a bowl of creamy, hearty soup! 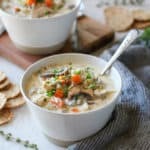 This Slow Cooker Creamy Chicken Wild Rice Soup screams comfort food to me. It’s chock full of tender chunks of chicken, loaded with hearty veggies and it’s made oh-so-creamy with Organic Valley Half & Half. This is a recipe I’ve been making since college and have tweaked it over the years by adding different veggies, omitting the flour, omitting the cream of mushroom soup, etc. It’s truly a classic Minnesota dish and the version I’m sharing today evolved from a recipe I found on the popular Taste of Home website years back. So a big shout out to Tasteofhome.com for helping me create this recipe! Any other Taste of Home fans out there?! I love that this recipe can be made in the slow cooker. Heck, I love all slow cooker recipes and how you can prep all of the ingredients the night before and then in the morning all you have to do is start the slow cooker and let ‘er cook. It’s like magic. 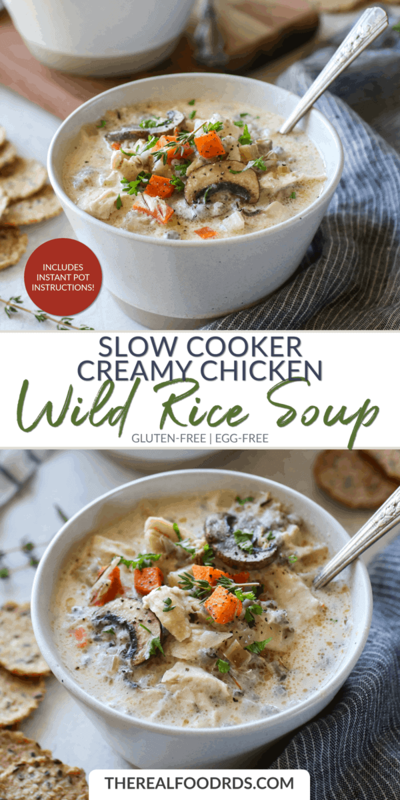 If set on low, you really can’t overcook this Slow Cooker Creamy Chicken Wild Rice Soup, but if you do have a slow cooker that has a built in timer that automatically switches the temp to “warm,” I’d recommend using that feature. Now if you’re an Instant Pot fan, I’ve included those directions below as well. I’ve got your back! For the chicken…you’ve got options. While the recipe calls for chicken breast in their raw state, if you have leftover chicken that you want to use up, that works too! 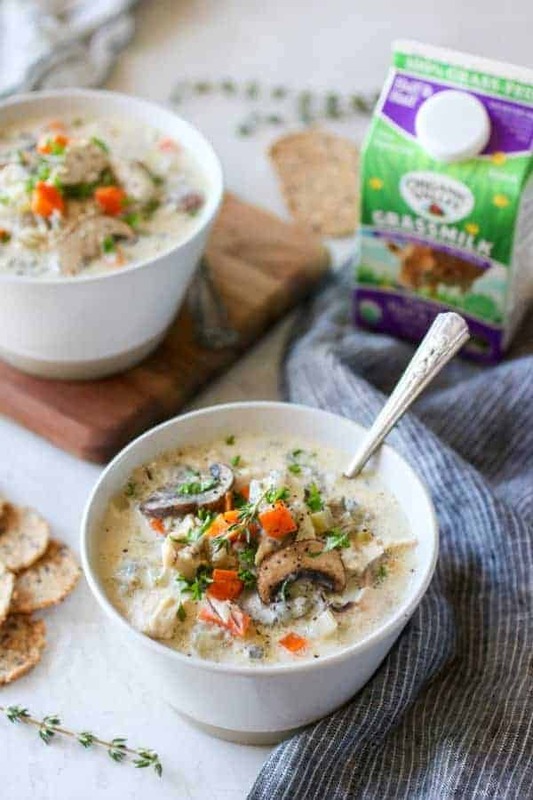 In fact, this Slow Cooker Creamy Chicken Wild Rice Soup recipe is perfect for using up leftover chicken, rotisserie chicken or our Instant Pot Shredded Chicken. Simply add the pre-cooked chicken to the slow cooker or Instant Pot at the same time you add the half & half. This is not a sponsored post, however I can’t express enough how important choosing quality organic dairy is. We have talked about this quite a bit on the blog and will continue to remind you of the importance. In fact, here is a blog post where you can learn more about why choosing organic dairy is important to your health, the planet, and the animals. Our go-to dairy brand is Organic Valley and we especially love their Grassmilk line which is made with dairy from 100% grass-fed cows. 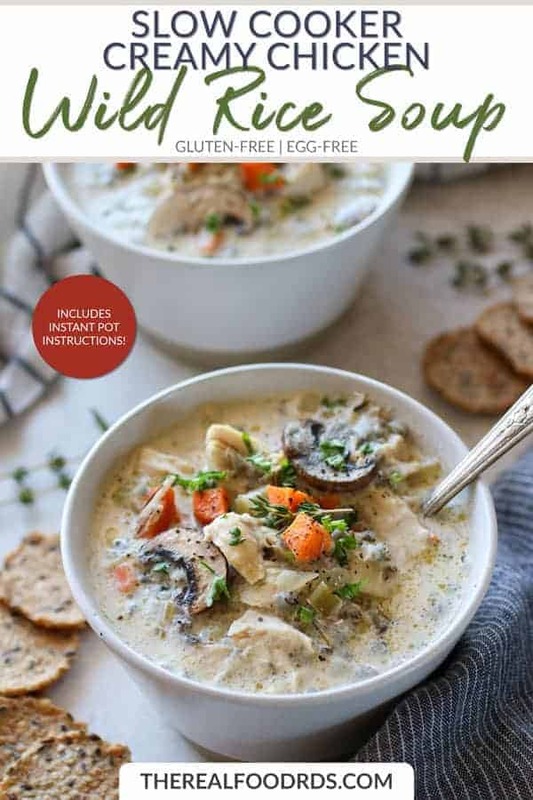 If you’re one who doesn’t tolerate dairy all that well, you may be wondering if this Slow Cooker Creamy Chicken Wild Rice Soup can be made dairy-free? Certainly. Simply use a can of coconut milk in place of the dairy and omit the butter or if you tolerate ghee, you can use that. It will have a slight coconut flavor, but it will still be super delish! Absolutely. Once the soup is done, transfer the soup to a freezer-safe container, allow to cool, cover and place in freezer. To reheat in the slow cooker: Remove from freezer the night before and place in fridge to thaw. In the morning, place the soup in a slow cooker set on low. To reheat in the Instant Pot from frozen: Place the frozen block of soup in the Instant Pot. You may need to let the container sit in warm water to loosen up the frozen block of soup in order to remove it. Set the Instant Pot on high pressure for 5 minutes. Then, release the pressure using the quick-release option. You can also reheat the soup from frozen on the stovetop in a similar fashion. It will just take a little longer to reheat. OK, that’s enough from me. I think it’s time to get slow cookin’! 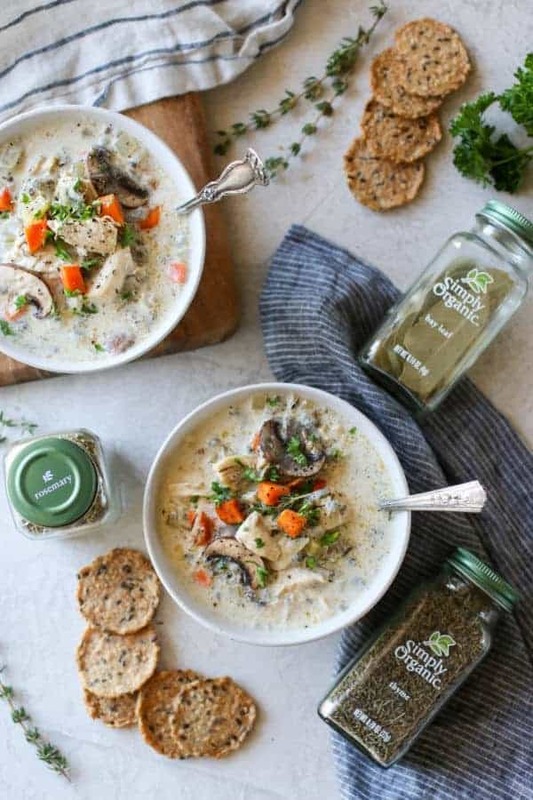 We’d love to hear if you give our Slow Cooker Creamy Chicken Wild Rice Soup a try! Oh so creamy and full of flavor. 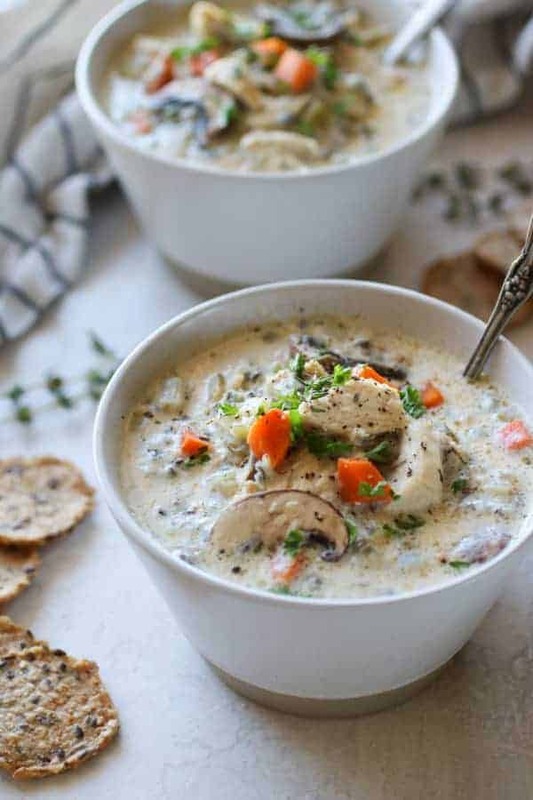 This Slow Cooker Creamy Chicken Wild Rice Soup is hearty, comforting and perfect for those cold winter days. Season chicken with salt and pepper. Place chicken into a 6-qt slow cooker. Stir in chicken broth, wild rice, garlic, onion, carrots, celery, thyme, rosemary and bay leaves. Cover and cook on low heat for 6-8 hours. Add mushrooms during the last 30 minutes of cooking time. Remove chicken from the slow cooker and shred, using two forks. Melt butter in a saucepan over medium heat. Whisk in half and half, and cook, whisking constantly, until well combined. Season with salt and pepper. Stir shredded chicken and milk and butter mixture into the slow cooker. Serve immediately, garnish with fresh parsley, fresh thyme and shredded or shaved parmesan, if desired. For a thicker consistency, stir in ½ cup potato flakes. Season chicken with salt and pepper. 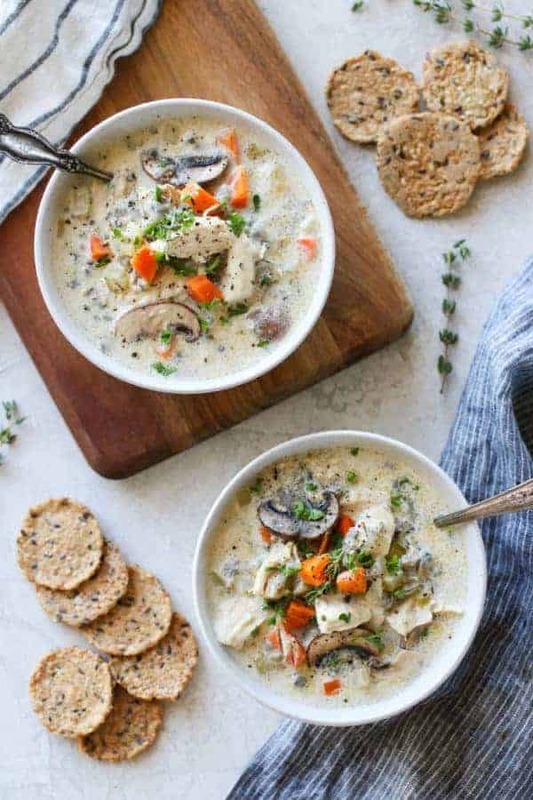 Place the chicken breast, broth (3 cups), wild rice, garlic, onion, carrots, celery, rosemary, thyme, bay leaves and mushrooms in the Instant Pot. Lock lid into place. Turn vent valve to ‘Sealing’ position. Select ‘Manual’ setting on high pressure and set cook time to 20 minutes. When cook time is up, allow pressure to naturally release for 5 minutes then release remaining pressure using quick-release method (i.e. flip the vent valve to ‘Venting’ position). When all of the pressure is released and lid unlocks, remove the bay leaves and discard. Remove the chicken and shred with two forks. On the stove, melt butter in a saucepan over medium heat. Whisk in half and half and cook, whisking constantly until well combined. Season with salt and pepper. Add the shredded chicken back to the Instant Pot along the whisked butter/half & half mixture. Stir to combine.